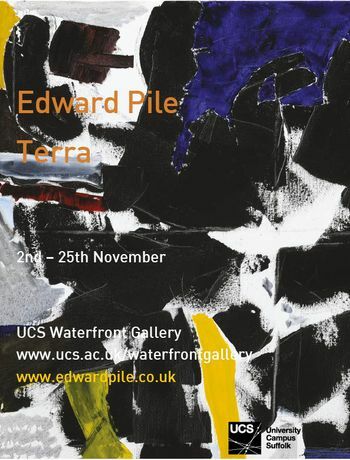 The Waterfront Gallery at UCS is proud to present Edward Pile whose work explores types and possibilities of pictorial order, intelligibility and meaning. I am interested in art as an exploration of possibility: the possibility of uncovering and discovering new expressive forms, and new forms of feeling. I try to make work that engages the full richness of aesthetic experience: sensorial, emotional and intellectual, to explore the human concerns of our place in the cosmos, our relation to nature, and the struggle to see the future. I hope I make works which offer an openness within aesthetic experience, and which repay sustained attention. Each work is a new beginning and an unforeseen ending. I begin with an intuition, and then continue until it has both a strong meaning for me and an independent integrity. I work directly, but often with long periods of repose and refinement. I have recently started throwing in stoneware, inspired by the East Asian tradition. Thrown forms, with their use in the home, have a moving immediacy and simplicity.